Former Harry Potter screenwriter Steve Kloves is to return to write the screenplay for the sixth Potter film. Mr Kloves adapted JK Rowling's first four Potter books for the big screen - including Harry Potter and the Goblet of Fire, set for release this month. 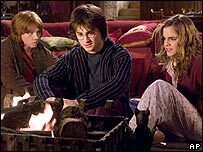 But Michael Goldenberg was brought in to work on Harry Potter and the Order of the Phoenix, due out in 2007. Mr Kloves' other films include Wonder Boys and the yet-to-be-seen Curious Incident of the Dog in the Night-Time. Mr Goldenberg will write and direct a futuristic drama for Warner Brothers once he completes the Order of the Phoenix script for the studio. "Steve is returning to a landscape and a group of people he knows intimately and cares about deeply," Warner Brothers pictures production president Jeff Robinov told industry daily Variety. "Michael is doing an outstanding job on the fifth Harry Potter movie, and we are collaborating with him throughout the production of that picture."